Tomorrow morning Barry and I will be running the 20th Annual Varmint 1/2 Marathon in Burkes Garden. This race has a pretty neat back story and I’m excited the race is finally here so I can share the story with you! There’s a reason this race is called “The Varmint”. Back in 1952 a coyote terrorized the Burkes Garden community, killing over 400 sheep and causing over $32,000 in damages. The coyote was referred to by the residents of Burkes Garden as “The Varmint”. It was finally killed when residents hired a bounty hunter. It is now on display in the Crab Orchard Museum in Tazewell. This back story is where the race gets it’s namesake. But there’s more. 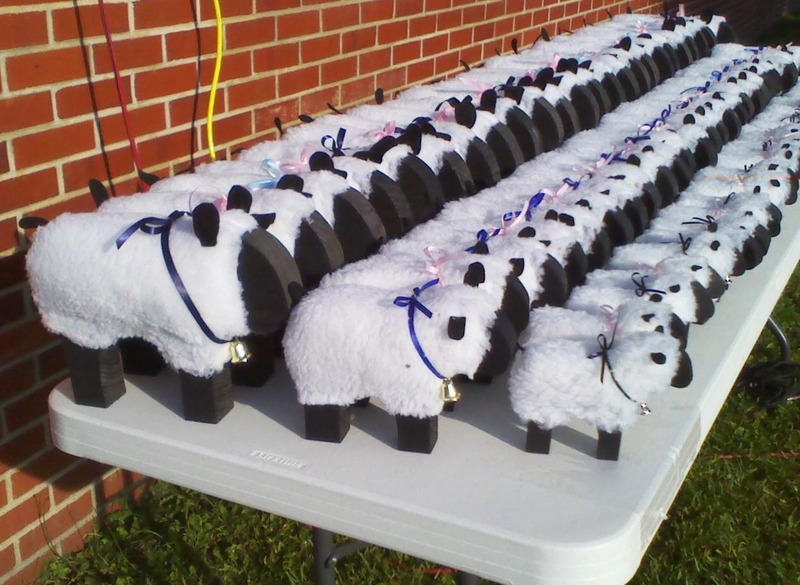 People who place in their age group, as well as overall winners of the race, receive trophies in the shape of sheep to commemorate the destruction caused by The Varmint. Aside from the beautiful, but challenging course, people often flock (yes… pun intended) to this race for the coveted sheep trophies. Barry and I ran this race last year and we were lucky enough to bring home some sheep trophies. I placed second in my age group and Barry placed third in his. Technically I was third in mine, but I bumped up because the first place girl in my age group pulled for an overall award. Later that day we had to make a trip over to the Crab Orchard Museum and get our picture with our sheep next to the Varmint. So now we are going back again in pursuit of more sheep for our mantle. The race continues to grow each year, so I expect it will be more competitive than last year. My main goal is to beat my time from last year (2:15:59). I am also, of course, hoping to place in my age group. I know Barry will be competitive in his age group and I can’t wait to see how he does tomorrow! Anyone else racing this weekend? Good luck! Have you ever run a race that has a back story like The Varmint? No hard and fast plans. Hope to get in a long ride on Saturday. Looks like the rain is supposed to end Friday night. Wanted to break out Gary and hit the Accotink, but I’m sure it will have too many impassable stream crossings. Guess I will stick to the the hard trails. Hope no drunks are driving their cars on the W&OD. Good luck at the Varmint. Hope you had a good ride! Watch out for cars. I love that the trophies are sheep! The best ones are always the ones which stand out on the mantlepiece! Yea the sheep trophies are really neat! Mine stands out on our mantelpiece because it’s the only age group award I’ve ever won, haha. Good luck!!! It sounds like it will be a great race! Thanks! Hope your first day of work went well. No races this weekend, and I can’t say I’ve ever run a race with so much history. Taking a bit of a racing break in order to get in some quality training. The story behind this race is a neat one. Good luck! The trophies are hilarious. I think that something unique like that would bring out the competitor in me, too! No race this weekend, but I’m committed to two more 4 (if not 5) mile runs on Saturday and Sunday. The kids are out of school and so we’ll all be together in the house. I hope you did well! I can’t wait to read your race recap. I remember my grandpa telling me about the varmit when I was little. He even had newspaper clippings from when it happened. I guess it was a pretty big deal since so many farmers lost so many sheep. I had no idea that the stuffed coyote was on display in Tazewell! Miles’ group joined the Cruisers for a big group run today and then everyone came back to our house for brunch. It was fun!